A man who has been identified as a "highly probable" case of swine flu is critically ill, it has been confirmed. The 37-year-old man, from Glasgow, was admitted to the intensive care unit of the Victoria Infirmary last Thursday. Health Secretary Nicola Sturgeon said: "It is not yet known whether flu was the cause of his illness, or whether it was incidental to it." There was no evidence he had contact with any known case of swine flu and had no history of recent travel. He was admitted with a chest infection but was routinely tested for a range of viruses. Results from those tests confirmed he was a positive case of influenza A and swine flu was "highly probable", Ms Sturgeon said. The health secretary said the man had a "severe bacterial infection" of his respiratory tract. He also had "significant" underlying health problems, was critically ill and was giving cause for "serious clinical concern". Ms Sturgeon added: "At this time - and perhaps this will always be the case - public health staff in Greater Glasgow and Clyde are not able to say if flu is the underlying cause of his deterioration, or if it is simply an incidental finding to his other health problems." Scotland chief medical officer Dr Harry Burns said the flu virus was picked up in routine testing for an infection. He said: "He has a number of health problems and this may just be coincidental to a condition that may be suppressing his immunity." 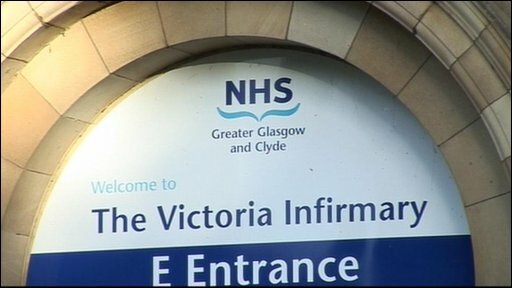 A statement from NHS Greater Glasgow and Clyde said: "We can confirm that a patient being treated in the Victoria Infirmary has been identified as a probable case of influenza A H1N1. "This patient is currently being treated in isolation." Scotland has had 13 confirmed cases of swine flu.